The New Delhi Metallo-β-lactamase (NDM) resistance mechanism in Enterobacteriaceae threatens to render serious Gram-negative infections untreatable. The NDM-1 enzyme hydrolyses all available penicillin, cephalosporin and carbapenem antibiotics, and is commonly accompanied by additional resistance mechanisms to multiple antibiotic classes. Initially identified as a significant healthcare risk on the Indian sub-continent, it has rapidly become a global problem, posing significant diagnostic and management challenges. Here we report the first laboratory-confirmed case of NDM-1 in South Africa. To the Editor: Resistance to β-lactam antibiotics in Enterobacteriaceae has steadily increased, with the emergence of carbapenem-resistant Enterobacteriaceae (CRE) seen in the past decade. Resistance to carbapenems may be mediated via a variety of mechanisms, but the development and spread of carbapenemases (β-lactamase enzymes that hydrolyse carbapenems and many other β-lactam antibiotics) in Enterobacteriaceae has caused global concern. One such carbapenemase, NDM-1 (New Delhi metallo-β-lactamase), first described in 2009,1 has rapidly emerged as the leading threat to the treatment of infections caused by Enterobacteriaceae. The blaNDM-1 gene has been found on conjugative plasmids, which are mobile genetic elements.4 This facilitates transfer of the gene between bacteria, resulting in the emergence of resistance in other unrelated genera, such as Acinetobacter and Vibrio.3,8 NDM-1positive bacteria often carry genes that confer resistance to other non-β-lactam antibiotics, like the fluoroquinolones, sulphonamides and aminoglycosides.4,7 Of additional concern is that resistance to tigecycline and colistin has been described, further limiting available treatment options.4,7 We report the first laboratory-confirmed case of an NDM-1-producing isolate from South Africa. A 63-year-old black man presented to the Charlotte Maxeke Johannesburg Academic Hospital, with a 2-month history of a productive cough, right-sided pleuritic chest pain, dyspnoea, fever, and weight loss. The patient had previously been well, but had recently been diagnosed with HIV (not started on antiretroviral treatment) and hypertension. He had 2 previous admissions to the same hospital in 2010, for a trauma-related injury and a diarrhoeal illness, respectively. No immediate family members sought healthcare in the recent preceding years. The patient's house was noted to have proper sanitation with running water. He was a truck driver by occupation and travelled primarily within South Africa, but had also recently travelled to Mozambique and Zambia. The patient appeared wasted with generalised lymphadenopathy and mild conjunctival pallor. He was apyrexial and normotensive. There were no chest scars or deformities, and he had clinical evidence of a pneumonic process in the right middle lobe. A chest X-ray (CXR) revealed an area of opacification in the right middle lobe, with an air-fluid level suggestive of either a complex pleural collection or a lung abscess. The patient was started on a course of intravenous amoxicillinclavulanate and oral azithromycin; treatment was changed after 5 days to oral ciprofloxacin (750 mg twice daily), after a carbapenemresistant Enterobacter cloacae was isolated from sputum cultures (refer to 'Laboratory testing'). Fluid collection was achieved with a pig-tail catheter under ultrasound guidance. Macroscopically, the collection appeared empyematous; the biochemistry was consistent with this observation. A total of 150 ml of fluid was drained over 3 days; the catheter was removed following complete resolution confirmed on CXR. The fluid was culture-negative and investigations eliminated the possibility of tuberculosis. The patient received HIVcounselling, was initiated on antiretroviral treatment, and discharged with follow-up scheduled at the outpatient clinic after 2 weeks. At the follow-up visit, the patient appeared to have recovered well. On re-culture of his sputum, an extended spectrum -lactamase (ESBL)-producing K. pneumoniae was isolated. No CRE were isolated with a screening rectal swab. The CXR showed complete resolution. The E. cloacae isolated from the sputum was identified with a MicroScan Walkaway system (Siemens Healthcare Diagnostics, USA). 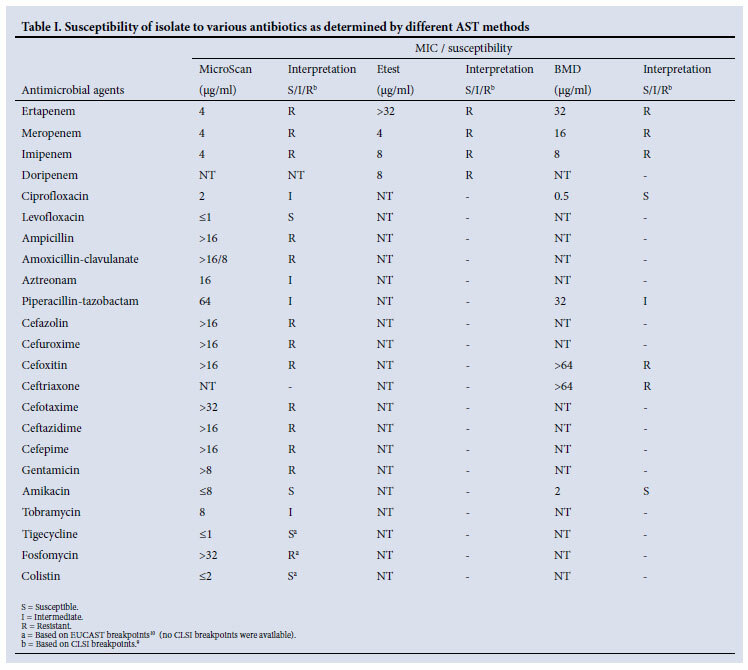 To verify the initial result, additional antimicrobial susceptibility testing (AST) was performed for a variety of antimicrobial agents, including a combination of broth microdilution and Etest (bioMérieux Clinical Diagnostics, France) (Table I). With the exception of tigecycline, colistin and fosfomycin, all minimum inhibitory concentrations (MICs) were interpreted using the Clinical and Laboratory Standards Institute (CLSI) breakpoints.9 The presence of a carbapenemase was presumptively confirmed using a combination of phenotypic methods. Using the method described by Zarfel et al.,11 the isolate was genotypically analysed using specific primers (Inqaba Biotec, Pretoria) designed to detect the presence of the bla NDM-1 gene conferring carbapenem resistance. K. pneumoniae strain BAA-2146 (ATCC, Manassas, USA), harbouring the bla NDM-1 gene, was used as a positive control. The emergence of NDM-1 in Enterobacteriaceae has heightened global concern regarding antimicrobial resistance. The MDR nature, propensity for horizontal transfer, and rapidity of global spread and emergence of micro-organisms harbouring this gene means that the threat of untreatable infections has arrived. To our knowledge, this is the first laboratory-confirmed case of an NDM-1-producing isolate in South Africa. The implications of this are multifactorial, affecting the laboratory and the bedside. Treatment options are limited, with colistin and tigecycline currently the only feasible choices. Susceptibility to these agents is not guaranteed and numerous clinical issues relate to their use in treating severe MDR Gram-negative infections. A dearth of pharmaco-kinetic and - dynamic data on the use of colistin compromises optimal dosing; literature suggests that it should be used in combination with other agents such as rifampicin.12 Tigecycline, a broad-spectrum minocycline analogue, has a high volume of distribution with low serum levels, raising concern as to its efficacy in the treatment of bacteraemic patients. Furthermore, Pseudomonas aeruginosa and several Enterobacteriaceae are inherently resistant to this agent. The efficacy of these agents in the treatment of severe infections caused by the described isolates remains to be determined. Active surveillance is crucial to establishing the true prevalence of this resistance gene. The expression of NDM-1 in other significant hospital pathogens, such as A. baumannii, also requires consideration. From the perspective of laboratory detection, additional surveillance capacity is required given the characteristic carbapenem-resistant nature of such micro-organisms, which may otherwise allow NDM-1 producers to go undetected. Phenotypic tests have limitations in detecting NDM-1; molecular confirmation is considered the 'gold standard'.8 Other infection prevention and control measures, such as environmental cleaning and selective decontamination of the gastrointestinal tract, may prove useful in halting dissemination and containing outbreaks of NPE. Acute healthcare institutions are urged to devise situation-specific infection control strategies for CRE, in an effort to stem the spread of these pathogens in South Africa. Vigilance and rapid action are our greatest weapons in the restricted arsenal currently available for combating this globally emerging resistance mechanism.